Hypoglossal nerve, cervical plexus, and their branches Source: Gray's Anatomy (1918). 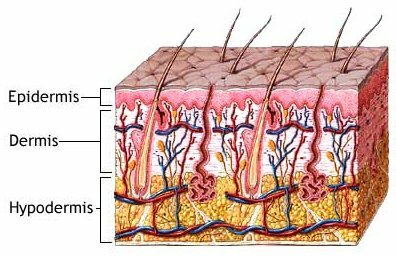 The hypodermis is a layer of tissue that lies immediately below the dermis of vertebrate skin. It is often referred to as subcutaneous tissue though this is a less precise and anatomically inaccurate term. The hypodermis consists primarily of loose connective tissue and lobules of fat. It contains larger blood vessels and nerves than those found in the dermis.